“Every unborn child, though unjustly condemned to be aborted, has the face of the Lord, who even before his birth, and then as soon as he was born, experienced the rejection of the world,” the pope said. The comments come one day after the release of an in-depth interview in which the Pope had explained that despite criticism he has avoided speaking about moral issues like abortion and gay “marriage” in his papacy, instead focusing on preaching about the love of Christ. “We cannot insist only on issues related to abortion, gay marriage and the use of contraceptive methods,” Pope Francis had said in remarks that were widely interpreted as a call for Church leaders to downplay the Church’s moral teachings on controversial issues. 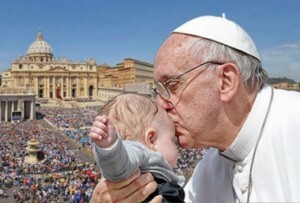 As he has in the past, Francis condemned a “throwaway culture” that would eliminate the weak and vulnerable in society. “Our response to this mentality is a ‘yes’ to life, decisive and without hesitation. ‘The first right of the human person is his life. He has other goods and some are precious, but this one is fundamental – the condition for all the others’”. Concluding, the Pope said, “bear witness to and disseminate this ‘culture of life’ … remind all, through actions and words, that in all its phases and at any age, life is always sacred and always of quality. And not as a matter of faith, but of reason and science! There is no human life more sacred than another, just as there exists no human life qualitatively more meaningful than another”. See the full text in Italian here. Will Advancements in IVF Ever Lead to Acceptance By the Church?